The Alliance plays a unique role in Rockingham County in our analysis of local, regional and state transportation plans and the potential impacts on the county’s rural landscape and agricultural economy. We support road projects that ease local traffic connections, use limited transportation funds wisely and minimize impacts on our communities and natural and historic resources. For more than 18 years, Rockingham residents have voiced their strong opposition to building a Harrisonburg bypass through our region’s beautiful farms, battlefields and rural hamlets. In that time, trends have continued to show the project makes no sense. 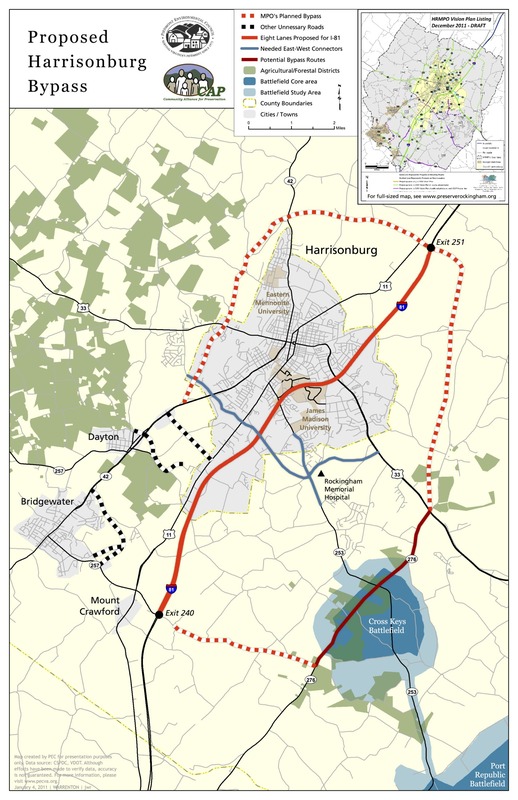 Yet a bypass-loop road project remains in the transportation plans approved at every level of government – Rockingham County, the City of Harrisonburg, the Metropolitan Planning Organization (MPO) and the Virginia Department of Transportation (VDOT) cutting through productive farmland and historic battlefields. We followed the MPO Long Range Transportation Plan closely because it will inform the Comprehensive Plans of both Rockingham County and Harrisonburg City and will call on you for input and comments at every opportunity.